At Settlement, our special programs create opportunities for the next generation of young musicians. From Music Education Pathways, to Sounds of Young Philadelphia and the PMAY Artists' Initiative, find a program that caters to your child's specific skills and interests. 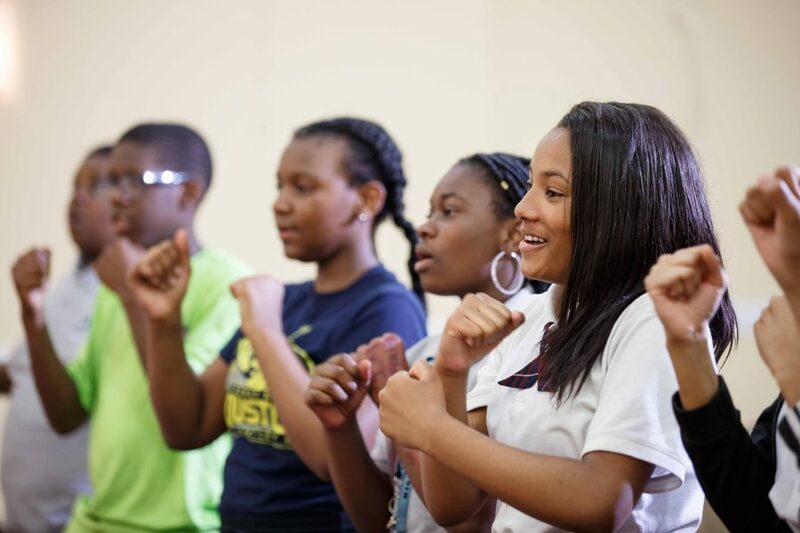 Music Education Pathways (MEP) connects neighborhood schools in Philadelphia with Settlement’s branches and, depending on the school’s needs, provides intensive ensemble training experience in band, orchestra, or choir, and small group instruction on a weekly basis. MEP works in partnership with local schools to complement existing music programs when needed. In addition to learning the fundamentals of music, student learning and participation in MEP is focused on the program’s five core values: creativity, teamwork, responsibility, persistence, and self-evaluation. MEP students perform during the year at their schools, Settlement’s branches, and at community locations. MEP culminates each year in a joint performance, with students from all participating schools working together to rehearse and perform a full concert in a major public venue. Sally Weiss at sally.weiss@settlementmusic.org or call 215-320-2686. Settlement is proud to offer special programming through Sounds of Young Philadelphia (SYP). Selected by Branch Director recommendation, SYP students are offered additional tuition subsidies for both Individual Instruction and ensemble participation, in addition to many other opportunities to engage in the arts. Eligible students must be between the ages of 8 and 18, have demonstrated financial need, and show a deep commitment to furthering their musical studies. Additional opportunities available for SYP students include a series of workshops to guide students and offer direction for their future studies, an instrument loan program, master classes and clinics with world-renowned musicians and chamber ensembles, and additional public performance opportunities. For more information, contact your branch director. The PMAY Artists’ Initiative is a major collaboration among ten Philadelphia music education organizations that will support current 5th through 12th graders from underrepresented communities to pursue their dreams of becoming professional classical musicians. The PMAY Artists’ Initiative offers students financial support to make lessons, music classes, youth orchestra participation, and summer music camps affordable. Students will be able to attend free college and career preparation workshops, and PMAY teachers and staff will work with each family to make sure each musician has an instrument and a strong plan in place for becoming the best musician he or she can be. PMAY Artists’ Manager Najib Wong at najib.wong@settlementmusic.org or go to pmayartists.org.